I have always loved swimming and being in the water; there is something wonderful about being weightless in this strange environment – the closest you can get to flying under your own power. You can also encounter some of the largest marine animals who can easily out-manoeuvre you in an instant and many could kill you just as quickly but choose not to out of curiosity or acceptance of the bubbling stranger floating by. I never really learned how to swim properly as my father taught me, which invariably involved lots of messing around, but what I lack in style I make up for in enthusiasm. 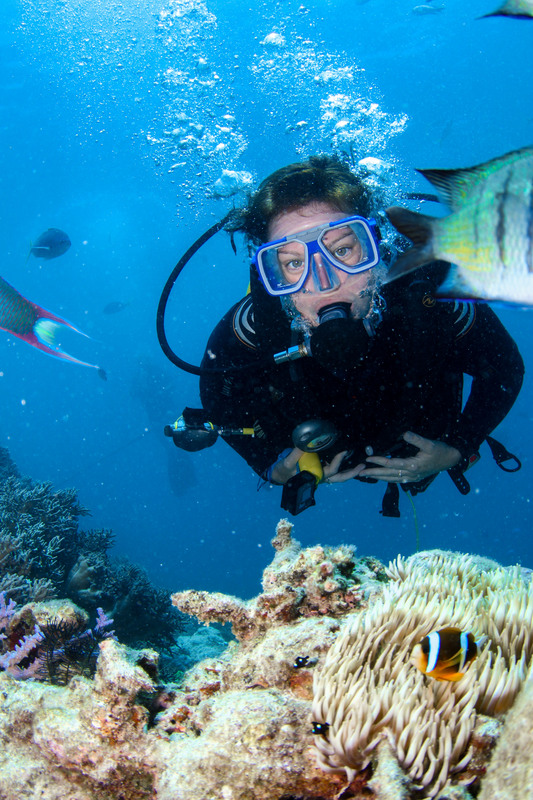 Then, embarking on an 8-month adventure to explore the world on a career break meant that I could finally achieve my dream of learning to dive. Having snorkelled with dolphins and basking sharks previously I wasn’t too worried about meeting all the strange beasts under the waves – my concerns were more mundane; would claustrophobia prevent me from enjoying it, what happens if I lose my air supply and most importantly, what happens if I lose my mask and contact lenses…?! Having arrived on the picturesque island of Mabul, off Borneo, my lessons began in the balmy turquoise water. Soon I was confidently throwing away my mask and air supply with abandon as we learned the safety systems for dealing with such emergencies. In modern life we tend to rely so much on ourselves as an individual but you soon learn to trust your diving companions as they are your only emergency service should anything go wrong. The days quickly passed as, when not practicing our skills one-to-one with the instructor, we were staring in wonder at the kaleidoscope of colours floating past as the fish busily went about their day. One day a poisonous lionfish approached us with all his hauntingly beautiful spines out on display to terrify the new students. You couldn’t help but watch in awe as he approached, but the instructor was less impressed, quickly placing his fin as a barrier between us. Raising a fishy eyebrow the lionfish sauntered off as if that had always been his intention, keeping his flamboyant spines out in defiance. I caught the wide eyes of a fellow student and back on land we received a lecture about all the things that are likely to kill you underwater - surprisingly sharks rarely get a mention. After quickly passing my PADI Open Water and Advanced courses I had gained enough skills to head out to Sipadan, a world-renowned site for diving with strong currents and lots of wildlife. Diving down we glided with the current along a wall of wildlife, stopping briefly where possible to get a glimpse of something interesting or a sleeping turtle. One green turtle came powering towards us against the current like a soaring bird of prey, knowing he had right of way and we would all move to observe him as he swooped through. Next came large shoals of fish with grey and reef sharks circling in the outer gloom of the deep blue; one heavily pregnant shark also skirted out there as we hugged closer to the wall. 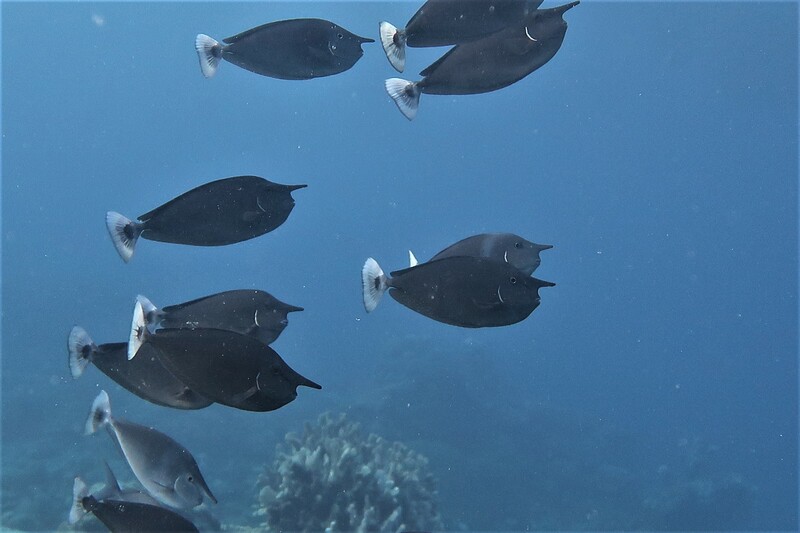 In the shallower areas a big shoal of bumphead parrotfish emerged, like cows of the sea these big lumbering fish, the size of a small suitcase, easily sat in the current whilst we struggled to maintain our position. For our last dive we briefly explored Turtle Cave which involved following the guides with torches into the spooky site, seeing a few turtle bones littering the floor. Whilst it was enjoyable I was relieved to come back out of the gloom – clearly my claustrophobia isn’t fully resolved just yet! As I continued travelling the world I wanted to pursue diving further, mainly to see the fantastic wildlife that can be found there and to see them on their own terms. Nothing beats the experience of seeing an animal up close in its own environment, which is more pronounced when you are in an alien atmosphere. In Australia I joined a liveaboard boat where we received full dive briefings, including compass points, and were then released into the water to explore for ourselves without guides. At first it was terrifying - surely the guides or Dive Masters were there to act as safety marshalls akin to escorting children across the road telling us where to go and what not to touch. After the first dive though, the new-found freedom was exhilarating - being able to explore unhindered and managing your own equipment and air reserves. We even went on self-guided night dives to see what the afterhours entertainment had to offer, unfortunately just missing the annual great coral spawning event by just a few days. Despite my minor apprehensions about diving I realise I was completely naïve about the risks involved. Most of the problems are not the ones you think of – sharks will glide past you gently or actively avoid you whilst lionfish and box jellyfish will not give you that courtesy. Ironically the most dangerous thing in the water is probably human beings and the devastation we cause through killing wildlife or littering their environment, with discarded fish nets also being a danger to divers. On each dive, even during training, we returned with various plastic wrappers, bottles and other items tucked into our wetsuits to dispose of on-shore. We live in a beautiful world and Mother Nature puts on a fantastic show beneath the waves, but it is slowly getting swamped by one species waste. Whether you want to join me exploring under the waves or not, please know that all your actions affect the animals living there too so recycle, reuse, repurpose all you can. The survival of our beautiful Blue Planet lies in the hands of us living in harmony with all it’s inhabitants, so lets make each day a step towards a brighter future – all our lives depend on it! - By Lisa George. Follow her adventures here.